My go-to lunch box treat is a slice of homemade banana bread, mainly because you can bet your life that by the end of the week there will be two or three manky bananas begging to be used up somehow. Here are 30 of the best tried-and-tested snacky bites that I turn to instead. From slices to scones, from muesli bars to muffins; there’s something for even the fussiest eater. And the best bit? Lunch boxes always come back empty! Sultanas, sunflower seeds, and pepitas, but NO NUTS (unless you count coconut!). 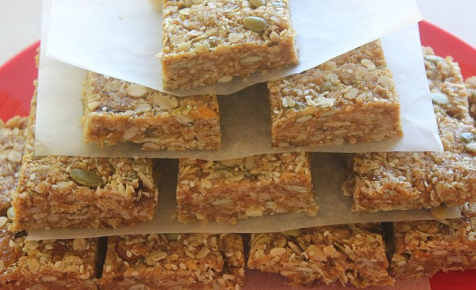 This is one muesli bar recipe that you can pop in their lunch boxes without a worry. Just two ingredients? Why yes! Amazing how much so very little can make. Combine oats (a slow release carb that will keep energy levels up) with dried apricots (full of iron) and you, my friend, have a lunch box winner. So I may be pushing the cereal bar description just a teensy bit here but, hey, they’ve got rice puffs in them and there are plenty of cereal bars on supermarket shelves boasting the same! I had you at ‘homemade’, didn’t I? This recipe is the one to grab when you’re having a ‘there’s nothing to put in their lunch boxes’ moment. Whip up a batch of these muesli bar beauties ready for their lunch boxes. Juicy fruit and sweet honey give these more-ish treats a deliciously moist bite. 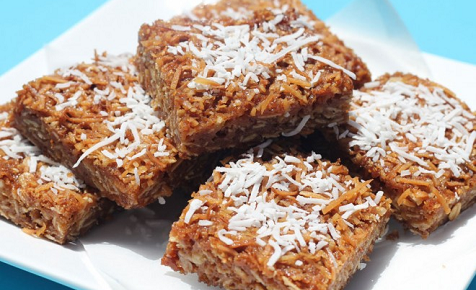 Oats, golden syrup and coconut … this is the oh-so-chewy slice version of our favourite bickies and oh-so-good for lunch boxes. An oldie but a goodie and the perfect way to use up the Weet-Bix crumbs that gather at the bottom of the cereal packet. This version’s got a sweet icing as a topping, too. You can’t go wrong with a traditional chocolate slice. How easy is this? Melt some marshmallows, fold in some rice puffs et voila, your lunch box treat is sorted. This one will have you polishing your halo. The goodness of wholemeal flour with juicy pear makes a delectable addition to any boring old lunch box. Cinnamon and nutmeg are the stars of this easy slice. Perfect if your cupboard is almost (but not quite) bare. There’s something comforting about a batch of scones. These are just like Granny used to make but even better thanks to the addition of some cheeky choc. Little ones with an intolerance to gluten shouldn’t miss out on all the lunch box fun. These gluten-free scones will make sure they don’t. Sneak some veggies in to their diet with these scrummy pumpkin scones. Perfect with a slice of cheese and perfect for the beginning of the week if you’ve got some leftover roast pumpkin from Sunday lunch. If your kids are bored with the same old sambos, try these savoury scones instead. A slice of cheese or some fresh ham make the perfect filling. 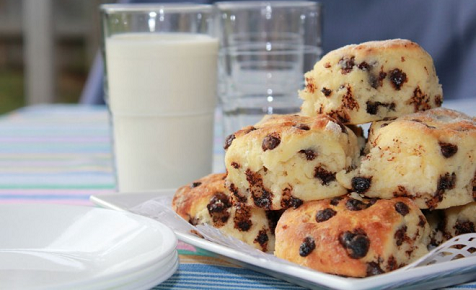 The great thing about these scones is that they are easy for the kids to make too. Light, fluffy and studded with juicy sultanas. Yum! Make these traditional sultana scones for a lunch box treat they’ll love. These pretty-as-a-picture fruity muffins taste as good as they look. Berry good, in fact. Keep some frozen blueberries on hand in the freezer and you’ll always have some ready to make these lunch box lovelies. Adding grated zucchini to these little bites of yum mean the kidlets eat veggies without knowing it (yay!) andyou get a super moist muffin to boot (double yay!). 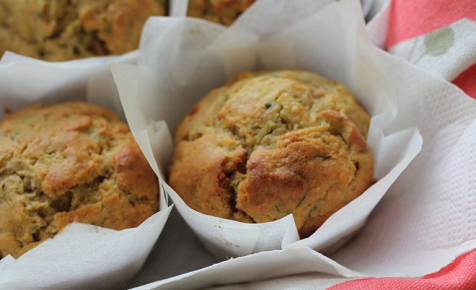 Here’s the recipe for these apple and zucchini muffins. Baking with bananas is a great way to use up over-ripe bananas – and to get something delicious to eat too! These banana and choc chip muffins have a wonderful banana flavour and are studded with little pieces of chocolate. These muffins boast a trifecta of goodness and yum. Oats keep blood sugar levels steady, dates are full of fibre … and honey? Well, honey just tastes divine. Add these heavenly oat, date and honey muffins to their lunch box smorgasbord. 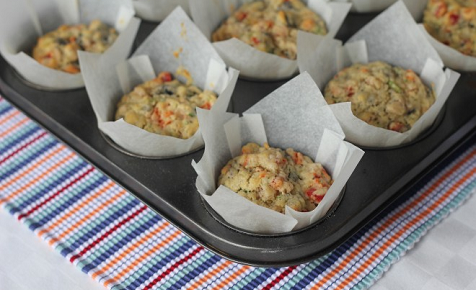 Another way to get more veggies into reluctant eaters, these muffins take all the best bits of your regular carrot cake and turn them into perfectly portioned lunch box bites. There’s even a cream cheese icing if you’re feeling a bit fancy. We used corn kernels, red capsicum and grated zucchini but you can use vegetables of your choice like finely chopped cauliflower, grated carrot and grated pumpkin. These are a party staple at our place (they go down a treat with a G&T) but I always make a double batch as the kids like them, too. The saltiness of the feta is what gets them, I think. Plus, I add spinach to everything so these win on that front too. Pumpkin adds a beautiful sweet flavour to these ostensibly savoury muffins and, might I be so bold as to suggest, that they go wonderfully with a slice of tasty cheese? Cheese + corn = the perfect savoury muffin in my book. My kids agree. I don’t know a kid who doesn’t like baked beans so turning them into muffins is a genius idea. A fibre and protein hit? Excellent stuff. My youngest adores pesto so these are always a great hit. They’re pretty nice for adults too.